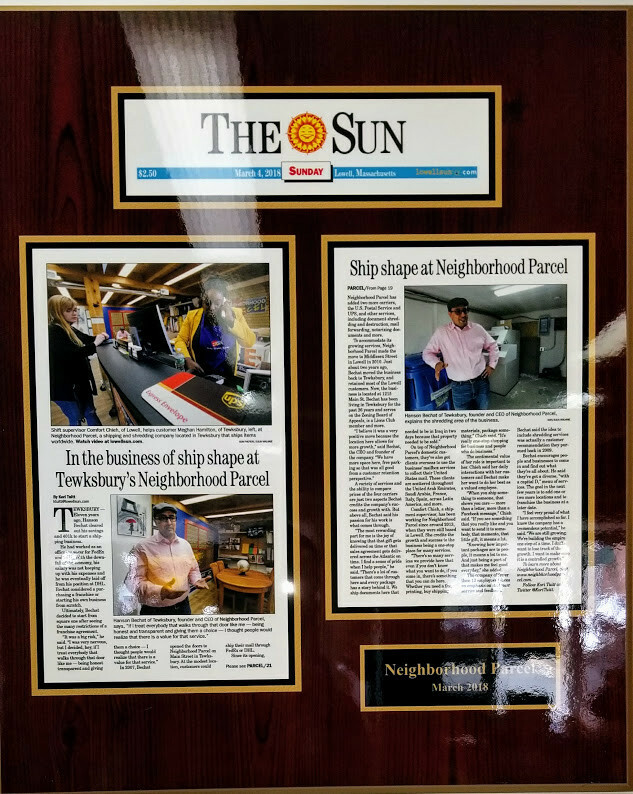 Hanson Bechat of Tewksbury, founder, and CEO of Neighborhood Parcel says if I treat everybody that walks through that door like me being honest and transparent and giving them a choice I thought people would realize that there is a value for that service. TEWKSBURY – Eleven years ago, Hanson Bechat cleared out his savings and 401k to start a shipping business. He had worked as an Operations Manager for FedEx DHL and Sorting Agent at UPS with the downfall of the economy, his salary was not keeping up with his expenses and he was eventually laid off from his position at DHL. Bechat considered a purchasing a franchise or starting his own business from scratch. Ultimately, Bechat decided to start from square one after seeing the many restrictions of a franchise agreement. In 2007, Bechat opened the doors to Neighborhood Parcel on Main Street in Tewksbury. At the modest location, customers could ship their mail through UPS, FedEx or DHL. For most Andover, Lowell, Dracut, Billerica, Wilmington, and Tewksbury MA, the company is an international gateway to international residents. Neighborhood Parcel keeps them connected with their loved ones through their international shipping services and DHL network. Since its opening, Neighborhood Parcel has added two more carriers, the U.S. Postal Service and UPS, and other services, including document shredding and destruction, mail forwarding, notarizing documents and more. A variety of services and the ability to compare prices of the four carriers are just two aspects Bechat credits the company’s success and growth with. But above all, Bechat said his passion for his work is what comes through. Shift supervisor Comfort Chieh, of Lowell, helps customer Meghan Hamilton, of Tewksbury, left, at Neighborhood Parcel, a shipping and shredding company located in Tewksbury that ships items worldwide. On top of Neighborhood Parcel‘s domestic customers, they’ve also got clients overseas to use the business’ mailbox services to collect their United States mail. These clients are scattered throughout the United Arab Emirates, Saudi Arabia, France, Italy, Spain, across Latin America, and more. Comfort Chieh, a shipment supervisor, has been working for Neighborhood Parcel since around 2013 when they were still based in Lowell. She credits the growth and success of the business being a one-stop place for many services. The sentimental value of her role is important to her. Chieh said her daily interactions with her customers and Bechat make her want to do her best as a valued employee. “When you ship something to someone, that shows you care – more than a letter, more than a Facebook message,” Chieh said. “If you see something that you really like and you want to send it to somebody, that memento, that little gift, it means a lot. “Knowing how important packages are to people, it means a lot to me. And just being a part of that makes me feel good every day,” she added. The company of fewer than 12 employees places an emphasis on customer service and feedback. Bechat said the idea to include shredding services was actually a customer recommendation they pursued back in 2009. Bechat encourages people and businesses to come in and find out what they’re all about. He said they’ve got a diverse, “with a capital D,” menu of services. The goal in the next few years is to add one or two more locations and to franchise the business at a later date. To learn more about Neighborhood Parcel, visit www.neighborhoodparcel.com.